BELLVILLE — Sept. 17, 2018, is the 231st anniversary of the drafting of the Constitution of the United States of America at the Constitutional Convention. The Jared Mansfield chapter of the National Society of the Daughters of the American Revolution was presented proclamations for Constitution Week, which will be celebrated Sept 17-23, by Bellville Mayor Teri Brenkus, Mansfield Mayor Tim Theaker and Ohio Genealogy Society Past President Sunda Anderson Peters. The Jared Mansfield chapter asks citizens to reaffirm the idealsthe rramers of the Constitution had in 1787 by vigilantly protecting the freedoms guaranteed to us through this guardian of our liberties, remembering that lost rights may never be regained. 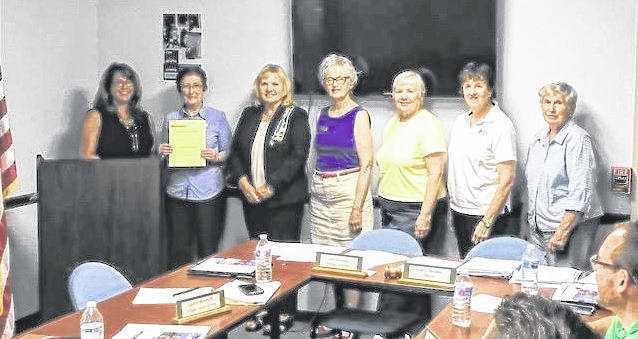 Jared Mansfield members Constitution Chair Joan Wyatt, Regent Joyce Vanatter, Marianne Bove, Diane Kracker, Dee Lorentz, Camilla Perrill, Maxine Sautter and Pat Jennings accepted these proclamations. Jared Mansfield Chapter NSDAR will have displays for Constitution Week iat the Richland County Public Library at Bellville and Mansfield, along with a display at the Ohio Genealogy Society (OGS) Bellville. The DAR, founded in 1890 and headquartered in Washington, D.C., is a non-profit, non-political volunteer women’s service organization dedicated to promoting patriotism, preserving American history, and securing America’s future through better education for children. DAR is dedicated to historical preservation, promotion of education and patriotic endeavors. Any woman 18 years or older who can prove lineal descent from an ancestor who aided in achieving American independence is eligible to join. For information about becoming a member of this historical and vibrant organization, call Joyce Vanatter at 941-224-4888.